Quoted in Newsweek (18 Nov 1969), 62, Pt. 2, 66. A misguided comment, often seen as the shortened quote “For the majority ... beneficial effect” in a list of regrettable remarks, without the fuller context of the quote given here. MacDonald was quoted in the article to be an example that physicians were not unanimous in their attitudes against smoking. The quote is an opinion expressed to the reporter; it was not the result of scholarly research. 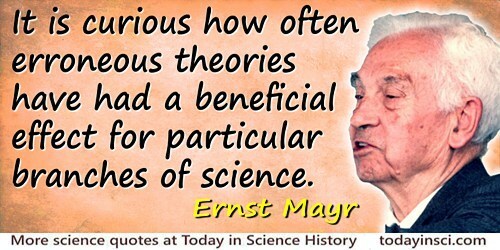 It is curious how often erroneous theories have had a beneficial effect for particular branches of science. The Growth of Biological Thought: Diversity, Evolution and Inheritance (1982), 847. It is usually not recognized that for every injurious or parasitic microbe there are dozens of beneficial ones. Without the latter, there would be no bread to eat nor wine to drink, no fertile soils and no potable waters, no clothing and no sanitation. One can visualize no form of higher life without the existence of the microbes. They are the universal scavengers. They keep in constant circulation the chemical elements which are so essential to the continuation of plant and animal life. In My Life With the Microbes (1954), 4. It was a great step in science when men became convinced that, in order to understand the nature of things, they must begin by asking, not whether a thing is good or bad, noxious or beneficial, but of what kind it is? And how much is there of it? Quality and Quantity were then first recognised as the primary features to be observed in scientific inquiry. 'Address to the Mathematical and Physical Sections of the British Association, Liverpool, 15 Sep 1870', The Scientific Papers of James Clerk Maxwell (1890 edition, reprint 2003), Vol. 2, 217. The law of diminishing returns means that even the most beneficial principle will become harmful if carried far enough. 'Penetrating the Rhetoric', The Vision of the Anointed (1996), 102. While the law [of competition] may be sometimes hard for the individual, it is best for the race, because it insures the survival of the fittest in every department. We accept and welcome, therefore, as conditions to which we must accommodate ourselves, great inequality of environment, the concentration of business, industrial and commercial, in the hands of a few, and the law of competition between these, as being not only beneficial, but essential for the future progress of the race.